"I was throwing a football with my best friend who was on vacation with us," Rogers told CBS News. "I looked down and saw something shiny. I thought it was a bottle cap, but realized it was a ring." Rogers said she knew it was a Marine Corps ring but didn't know much more about it. Inscribed in the ring were the letters and numbers "PLT 1041, 6-30-17." She and her husband figured out what the letters meant: Platoon 1041, from Parris Island, graduation date June 30, 2017. With this little bit of information, Rogers was confident she could find the owner of the ring. She posted about the lost treasure Sunday on Facebook, and her plea for help finding the owner went viral. Local newspapers and TV stations picked up the story. She also tweeted about it and tagged the Marine Corps in hopes of spreading the word. By Monday, she was shocked by the amount of replies she received. "I was like, seriously? I have had so many people reach out to me," she said. One reply stood out to her. She got an email from a man who claimed the ring was his. "He's not on Facebook, so he didn't see me post it," Rogers said. "He just happened to casually mention to a coworker that he lost a ring and a rosary on the beach. The friend saw my post in the newspaper and told him about it." Rogers wasn't completely convinced the ring actually belonged to the man, who said his name was Jaime Andrade. "He and I talked for a few days because I was not 100 percent sure, because the information didn't match up exactly with the inscription inside," Rogers said. Rogers said his name didn't appear on a list of Marines who graduated on June 30. Rogers reached out to members of Platoon 1041 at Parris Island. Because her post went viral, several Marines heard about the missing ring and were helping her look for the owner. Most of the people she asked said they didn't know of a Jaime Andrade in their platoon. But she continued her search, obtaining a record showing all Marine Corps graduates from Parris Island. The list of Marines included just their first initial and last name, so she tried to contact every "J. Andrade" on the list. She said she reached out to about four. Finally, she corroborated Andrade's story. He was supposed to graduate on June 30, but because he was injured, his date got pushed back two weeks. He actually walked in graduation on July 14, 2017. Now that Rogers confirmed that the man who reached out to her was the rightful owner of the ring, she made plans to meet up and return it. Rogers and her husband met up with Andrade at Siesta Key Village. She described Andrade as a "super sweet guy, super young -- only 22 years old -- very shy." He also explained how he lost the ring. "He went swimming one night and left the ring on the sand with his shoes ... I guess it fell out," Rogers said. Rogers said she and her husband hung out with the Marine after returning the ring. "I bought him a beer and we played a game of pool," she said. 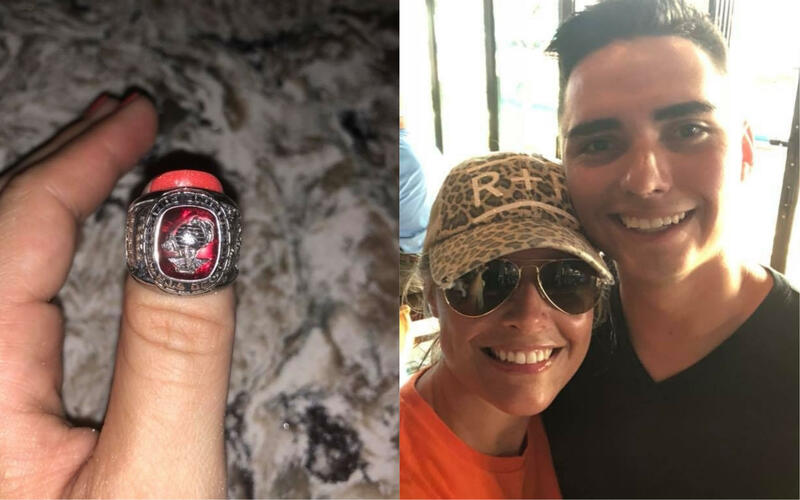 And Andrade, who is in the reserve and lives nearby Siesta Key, was very grateful his ring made it back to him. Rogers was also grateful for the help she received in finding Andrade and that she was able to meet him in person. "I knew that it was important to somebody and I know the power of social media ... I knew that I would eventually find him, I didn't think it would be when i was still on vacation," she said.